The global trading system, with the World Trade Organization (WTO) at its center, has been under stress for more than a decade.1 The Doha Round of trade negotiations failed to make progress beyond the Trade Facilitation Agreement. This has led many to ask whether the WTO can sustain the open trading system, which it and its predecessor institution, the General Agreement on Tariffs and Trade, have helped spawn. The challenge to the open trading system has reached a new height following the election of President Donald Trump in the United States. 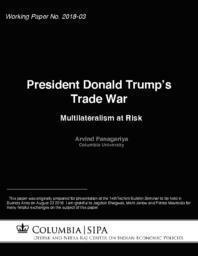 Under him, trade tensions have turned into a trade war of sorts, which threatens to bring down the entire multilateral trading system. The question now being asked is not whether conflicting interests of major trading nations would damage the system—that damage has already begun—but whether a different future leadership in the United States would be able to repair that damage and return the system to its healthier self. The sources of stress in the trading system and possible solutions, if any, constitute the core of this paper. Before we get to that discussion, however, it is useful to take a brief stock of the history of the evolution of the global trading system. This stocktaking would help us appreciate that the road to achieving and maintaining a liberal trading system has always been bumpy. And yet, we have achieved unprecedented progress in creating and nurturing a highly open trading system. This liberal trading system has brought unprecedented prosperity around the world and is therefore worth every bit of our effort to preserve it.